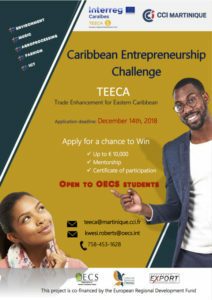 Wednesday, December 5, 2018 — The Trade Enhancement for Eastern Caribbean Project (TEECA) has launched the Caribbean Entrepreneurship Challenge – a competition for tertiary level students to gain access to funding and mentorship in business development. Applications are open until December 14, 2018 to students aged 16-34. Interested students from OECS Member States pursuing tertiary education at universities and colleges within the OECS are invited to participate. Participants must apply in teams of no more three (3) students to develop a creative and innovative business idea for the competition. Access more information and apply here! Entrepreneurs can also download the attached application form and submit it to the following email addresses on or before December 14, 2018: kwesi.roberts@oecs.int or s.pujar@martinique.cci.fr. The TEECA programme aims to serve as a major pillar in the efforts to increase exports of OECS firms to regional and international markets. The Youth Entrepreneurship Challenge provides an opportunity for Tertiary Level Students from Martinique and the OECS to engage in cultural exchanges through an entrepreneurship and business competency competition.